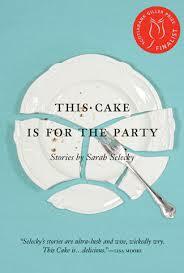 This Cake is for the Party is a collection of short stories, which does not feature a story with the cover title. Ironically, the title is what drew my eye to the book. The book is a collection of stories that unfold during dinner parties, coffee and glasses of wine and more. The broader theme is the ups and downs of relationships both starting and ending. Like all good short story collections, the pleasure is in being able to finish a complete tale in one sitting but also leaving you wanting more. This Cake Is for the Party was a finalist for the Scotiabank Giller Prize and the Commonwealth Prize for Best First Book in Canada and the Caribbean, and it was longlisted for the Frank O’Connor Prize. Selecky is a writer and creative writing teacher who lives in Toronto. She is currently working on a novel based on one of the characters from This Cake is for the Party. She won't say when it will be done -- how smart! The battlefield in Ben Fountain's novel is Dallas Cowboy Stadium circa the early 90s. The stadium, the NFL, Texas, Hollywood and corporate America are all sets where Billy Flynn tries to make sense of a recent firefight in Iraq that has made him and his surviving squad members celebrities. They are on a "victory" tour, propped up to give voters a reason to support a war that is not going well. The clever conceit of the book is to juxtapose the obscenity of war against the excess of American consumerism. The Thanksgiving day stop at the stadium is the final stop on their odyssey before they had back to the front. They are dealing with the surreal atmosphere of home compared to the now known terrain of war. Both are extremes. "No one spits, no one calls him baby killer. On the contrary, people could not be more supportive or kindlier disposed, yet Billy finds these encounters weird and frightening all the same. There's something harsh in his fellow Americans, avid, ecstatic, a burning that comes from the deepest need. That's his sense of it, they all need something from him, this pack of half-rich lawyers, dentists, soccer moms and corporate VPs, they're all gnashing for a piece of a barely grown grunt making $14,800 a year." The book is told from Flynn's point-of-view as he mourns lost "brothers," while reshuffling the place his own family plays in his life. It all matters and yet it's a lot to process. I started this book as a download from the library and since I didn't finish, I had a choice to make. I needed to know how the story ended, so I bought the e-version. This short trip brought home the strange isolation of war -- for everyone involved. This book came to my attention via the WSJ on-line book club. The discussion was led by The Kite Runner author Khaled Hosseini. Their May choice is Patricia Highsmith's Deep Water. The discussion will be led by Gillian Flynn, who wrote Gone Girl.